Martin Luther King Jr. Day celebrates the American Baptist minister and activist who was a key lead in the civil rights movement in the United States in the 1950s and 60s. 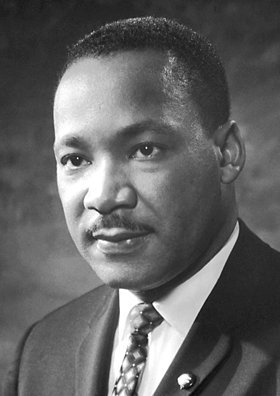 King was known for advancing civil rights through means of non-violence. He led the 1955 Montgomery bus boycott, nonviolent protests in Birmingham Alabama in 1963 and the March on Washington that same year when he delivered his “I Have a Dream” speech. In 1964, Martin Luther King won the Nobel Peace Price for his efforts again racial inequality and nonviolent resistance. In 1965 he organized the Selma to Montgomery marches. In 1966 he marched in Chicago to protest segregated housing. He also protested against poverty and the Vietnam War. He wasn’t always popular, either, as FBI leader J. Edgar Hoover considered him a radical and had him investigated for possible communist ties. King was assassinated on April 4, 1968 in Memphis, Tennessee which caused riots in many US cities. James Earl Ray was convicted and imprisoned for having killed King. He serve 29 years and died in prison in 1998. Posthumously, King was awarded the Presidential Medal of Freedom and the Congressional Gold Medal. President Ronald Reagan signed into federal law that Martin Luther King Jr. Day would be celebrated in 1986.